The Koblenz P-820 B cleaning machine, is designed to keep the carpets, rugs and hard floors clean and spotless. This Blue rug shampooer scrubs, polishes, waxes and shampoos all kinds of floors with professional results and little effort, so you don't have to rely on professional cleaning services. 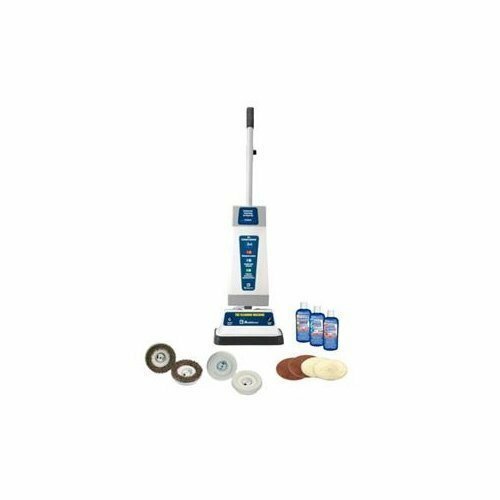 This Koblenz cleaning machine features accessories including various brushes and pads to provide an efficient cleaning. It consists of twin brushes to provide optimum cleaning. This Koblenz P-820 B cleaning machine, offers a cleaning width of 12 inch to allow you to clean with minimum strokes. With high-impact housing, a powerful all-metal 4.2-Amp motor and full-width bronze gears, the floor shampooer is sure to deliver an outstanding performance. It features a T-bar handle with grips for increased stability and efficiency. Includes 1 pair each of shampoo brushes, scrubbing brushes, tan polishing pads & lambs wool buffing pads plus one 8.11oz bottle each of carpet & fabric shampoo, heavy-duty cleaner & neutral cleaner. Assembled product dimensions (L x W x H): 11.40 x 12.00 x 25.50 in. If you have any questions about this product by Koblenz, contact us by completing and submitting the form below. If you are looking for a specif part number, please include it with your message.